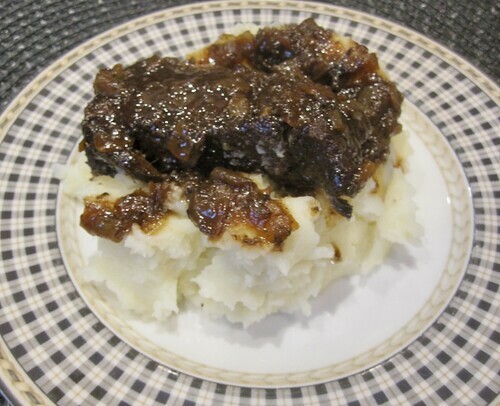 Short ribs braised in red wine, balsamic vinegar and brown sugar get a nice, rich glaze, perfect for serving atop mashed potatoes. Add red wine to pan. Bring to a boil and let it simmer for a minute before adding beef broth, Worcestershire, vinegar, brown sugar and orange zest. Return to a boil, cover, and transfer to the oven to cook until meat is fork-tender and sauce is rich and full of depth, 2 1/2 to 3 hours total, flipping meat once during cooking. While the meat is cooking, bring potatoes to a boil in a large pot over medium-high heat. Cook until tender when pierced with a fork, 20 to 25 minutes. Drain, return to pot and add butter, milk and sour cream. Season with salt and pepper, and mash with a potato masher or a fork. When short ribs are done cooking, discard orange zest. Season salt to taste with salt and pepper. To plate, place a mound of mashed potatoes on each of four individual plates. Top with a short rib, and spoon with sauce. Serve immediately.